"Uncle John", as he was known to all his relatives as well as to many friends; "Grandpa John" to his grand and great grand children, will always be remembered for his great sense of humor. He could always see the funny side of any encounter. Dad was always trying to improve his mind. He spent many hours reading, studying English, history, and the writing course to which he sub­scribed. After the age of 80 years he published three books of poems of which he was very proud. We family members were also proud of his accomplishments, as he had only a sixth grade formal education. He also wrote accounts of incidents as he remembered them which were published in the "Home Town" column of the Wichita Eagle from time to time. We always enjoyed reading these and were proud when they appeared. "Aunt Frances", our mother was always willing to go along with Dad on his many adventures, and believe me, there were many. She was always happiest when she had her family with her, and always looked forward to the visits of any of the family. Mother loved flowers and had flowers blooming all summer. Her peonies were blooming for memorial day and she gave many to friends and neighbors for the graves of their loved ones. Although her health failed rapidly in her last few years she was happy when it was possible for her to get out to her flower beds and do a little digging. Standing: Frank, Augusta, Louis, Antoinette. 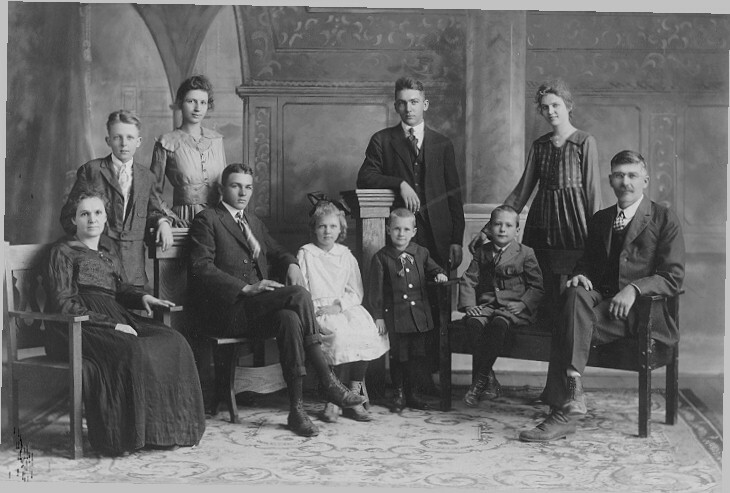 Frank Pivonka notes in his Delphi Forum "When this photo was made, my grandmother Augusta was already dead Dec 1918. She was included in this photo through the artistry of the photographer. 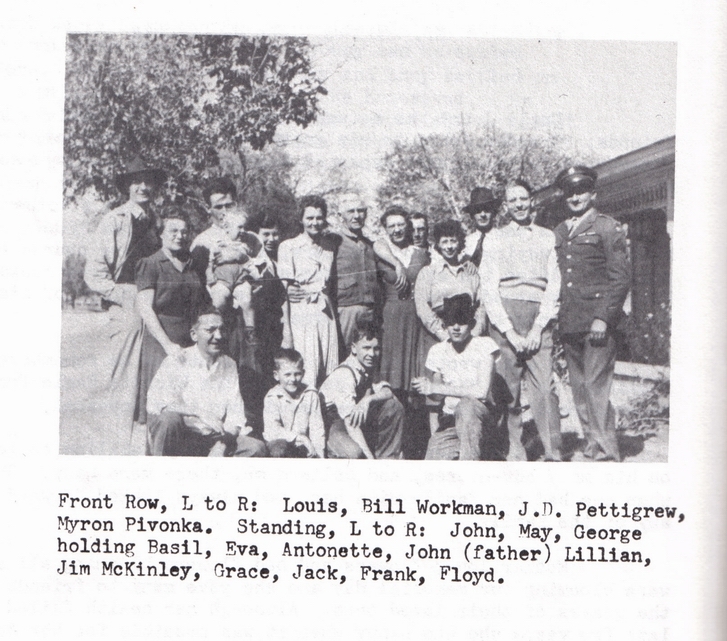 You can see a slight light gap between Jack's head and Augusta's body." 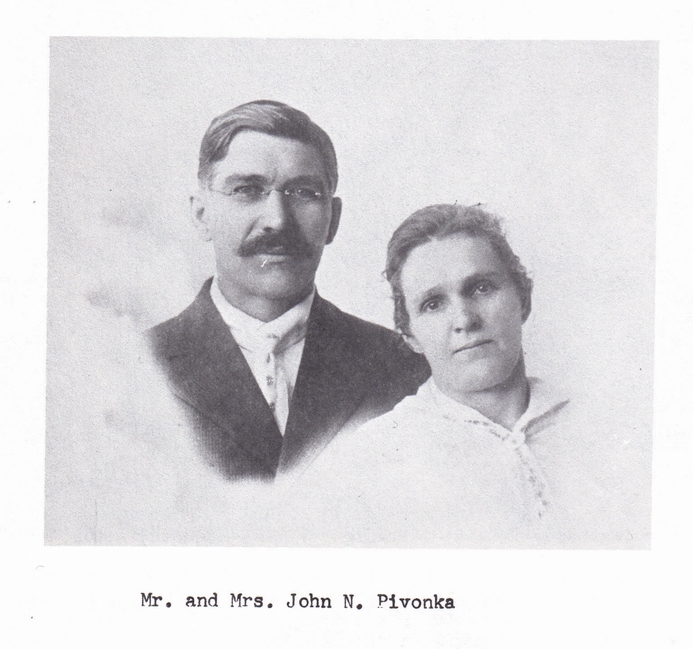 In addition to JN Pivonka's literary accomplishments, he had at least one US patent to his credit, and we need the records for that. 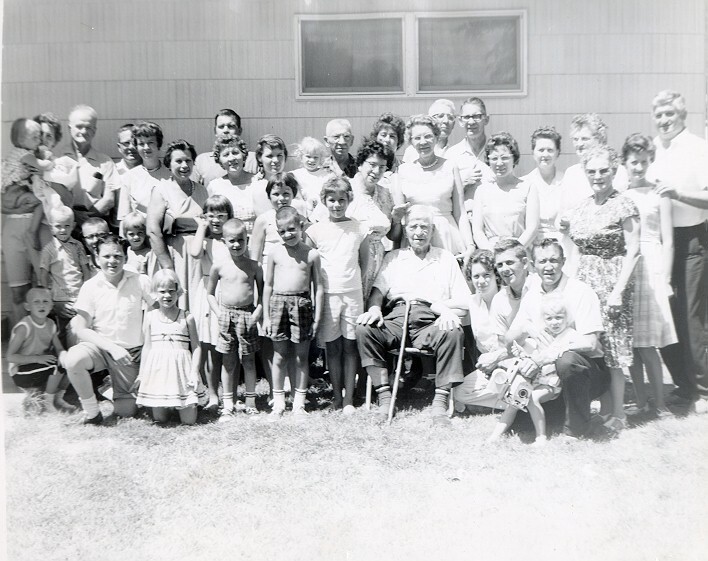 Myron Pivonka (P441) has provided these photographs of Uncle John and family members.